We supplied exterior and interior windows, doors, mouldings, hardware and locks. Interior doors were semi-custom 7’ high as opposed to standard 6’8 or 8’. All done in rift cut white oak doors with opposing directional veneer pattern. This door request was brought to us by the designer with just a picture that she had. 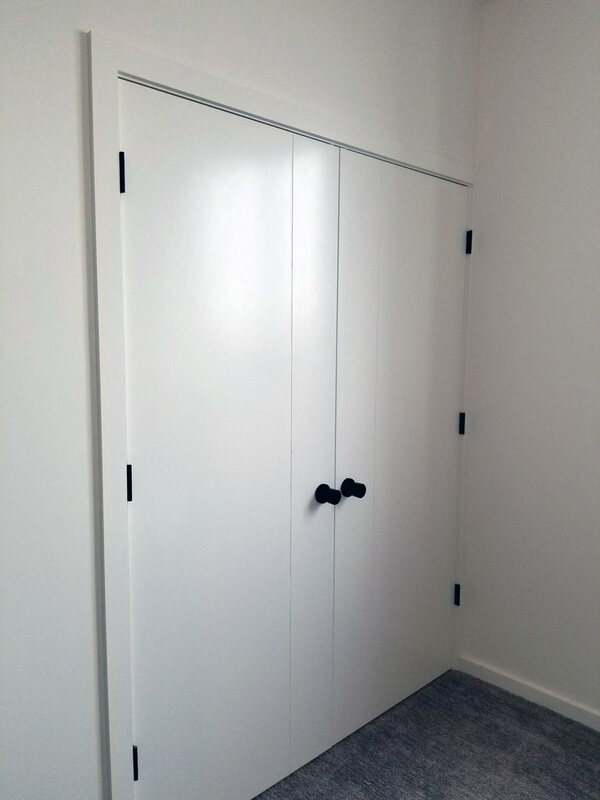 This is not a production door that anyone makes, so we had one of our suppliers draw it up and build it. The door came out beautifully exactly as requested on time and on budget. As well as all the hardware and trims. We worked on this third lottery home for Haven Builders in three years. 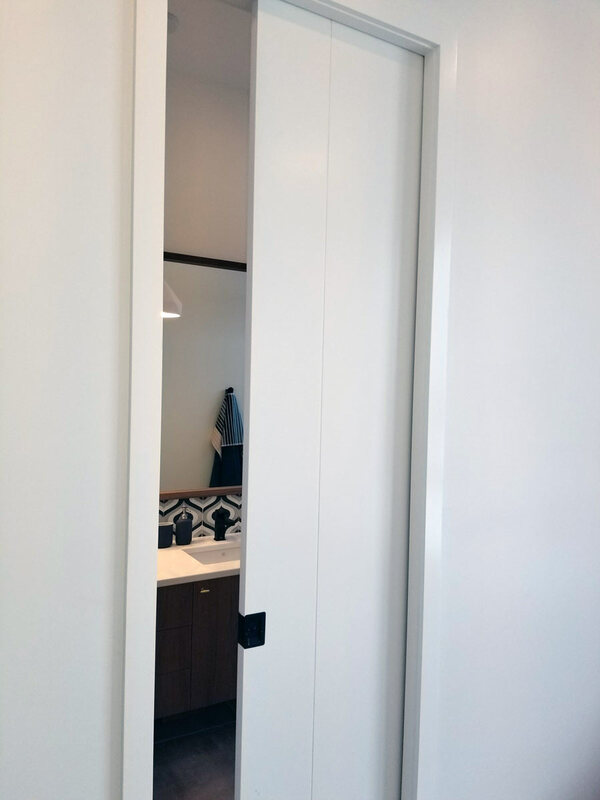 They wanted something simple, sleek and ultra contemporary so we made this door just a single vertical line and it looks fantastic with the Barcelona oil rubbed bronze knobs in this mid century design home. We built a unique door in this master bedroom separating bath and bedroom areas. 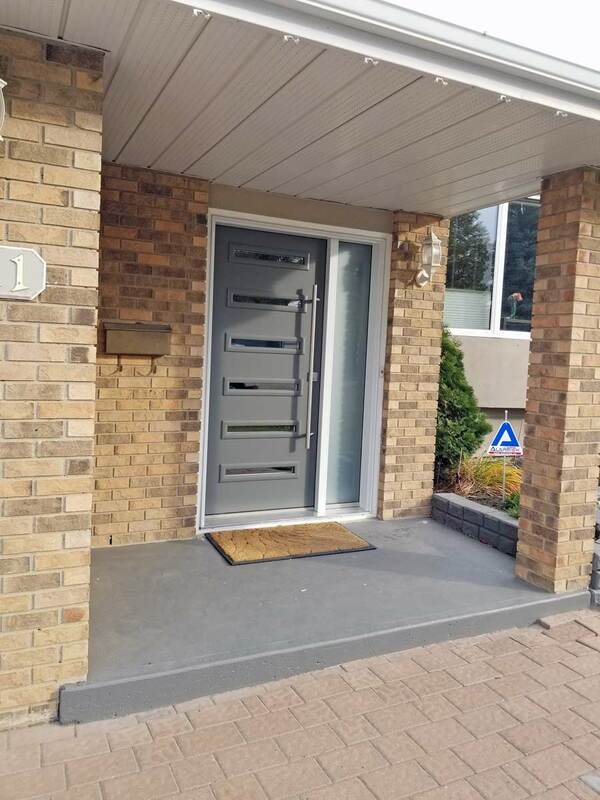 It was a very challenging and heavy door, 10' x 8' powder coated metal all on one rolling track so there is no obstruction on the floor. For this client we also replaced windows, and overhead door, and a front entry door pre-finished with auto body quality paint finish. "Hi Tom, we are very pleased with the service you provide. It is very personal and professional. I have always felt you looked out for my best interests and that is a very rare thing these days. Thank you." Custom size doors any width or height can be ordered for unique applications such as this shaker door under a stairway in this newly built home in Nutana. Basement egress compliant windows can be cut into existing concrete basements or retrofitted if the existing opening is big enough. We can box these windows in with maintenance free materials. We have earned a Thumbs Up from Trusted Saskatoon. We are licensed and insured (City of Saskatoon Business License #BL-2018-1619638).